Where the removal of impurities in the hydrating plant is not important, the quicklime is often reduced in size using impact breakers. In other circumstances, rolls and jaw crushers, or cone mills may be used. 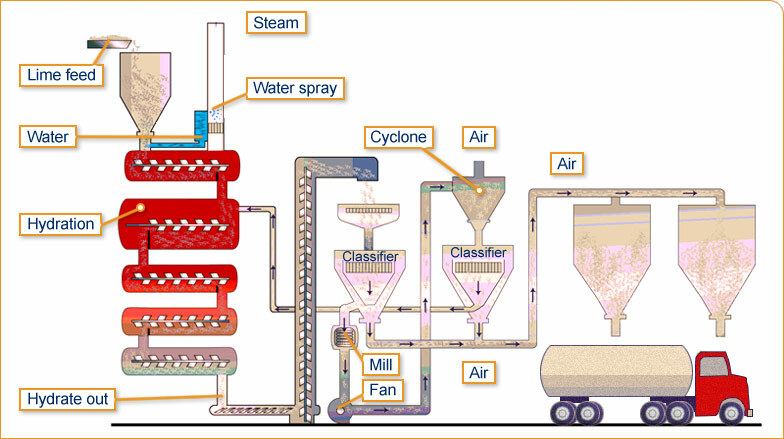 Hydrators usually consist of three main sections – prehydrator, hydrator and finishing stage. The final moisture content of the raw hydrate after the finishing stage is usually about 1%. The raw hydrate is then classified. Depending on specification, the raw hydrate can be adjusted and cut even further to meet requirements. Finished products can be either stored or dispatched by rail or road. Alternatively they can be packed into bags which are then purchased by a range of customers, including steelmakers, DIY stores and builders merchants.